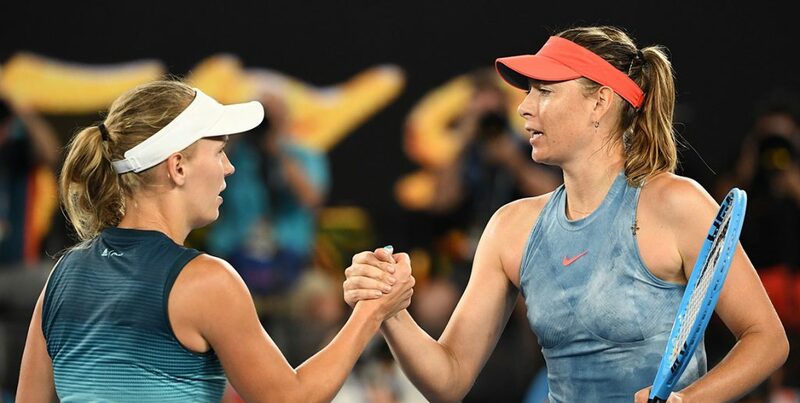 A three-set slugfest between former world No.1s Maria Sharapova and Caroline Wozniacki ends with Sharapova advancing to a fourth-round showdown with local star Ash Barty. Maria Sharapova is targeting home hope Ashleigh Barty after ending Caroline Wozniacki’s Australian Open title defence in brutal fashion. The resurgent former champion will meet Barty in a fourth-round blockbuster on Sunday having vanquished the Dane 6-4 4-6 6-3 in two hours and 24 minutes at Rod Laver Arena. “Her story is phenomenal. She loves playing here and did extremely well in Sydney last week,” the 2008 Australian Open winner said of Barty, who got past rising Greek Maria Sakkari 7-5 6-1 earlier on Friday. In an ominous third-round display, Sharapova smacked 37 winners to Wozniacki’s 10 – 24 coming off her forehand wing. It was a battle between two former world No.1s and Grand Slam champions in a third-round affair more befitting of a match deep in a major tournament. The victory extends Sharapova’s head-to-head lead over Wozniacki to 7-4 in what was their first meeting on tour in nearly four years. “I felt very much in the moment. I felt present,” she said. “I was anticipating the match and I wanted that match to happen and these are really the types of match-ups that I haven’t really had where I could really challenge myself. “I thought it was, as usual, as expected, a physical match. Didn’t have to be in some ways, but I felt like even in the longer rallies I did a great job of winning those. Put a lot of pressure on her. The 31-year-old Sharapova is playing her 15th Australian Open and hopes to draw on that experience against the young Australian, who will be backed by raucous home fans. “I know she took a little break from the game and came back and resurged,” Sharapova said after Barty took an 18th-month hiatus from tennis in 2014-15 after falling out of love with the sport. Sharapova, who was hit with a two-year doping ban – later reduced to 15 months – for testing positive to banned substance meldonium at Australian Open 2016, hasn’t won a major since her 2014 triumph at the French Open. Wozniacki, meanwhile, said she fought as hard as she could, yet simply came up short. “I did my best out there. I was fighting till the end,” she said. “In my head I should have won that first set. Being up 4-1, I had a chance to do that, but I didn’t, and then I fought back and won the second set. Then it was a close third set. It just wasn’t enough today.